Bless the European Banking Authority: it's put out a warning suggesting consumers steer clear of Bitcoin. As if they could actually afford it in the first place. It’s been a bit of a week for Bitcoin. Not only has the cryptocurrency cheerily lurched between $340 and $1,240, but now the European Banking Authority has all but suggested that consumers steer clear of it. This morning, the European Banking Authority put out a ‘consumer warning’ (its second ever) explaining the risks of electronic currencies. 1. ‘You may lose your money on the exchange platform’ – ie. the websites people trade Bitcoin on are unregulated and liable to suddenly disappear without trace when they go out of business/their teenage zillionaire proprietors get bored and move on to another project. 2. 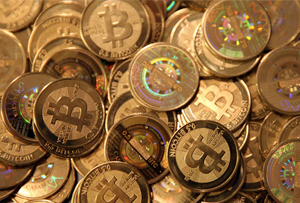 ‘Your money may be stolen from your digital wallet’ – Bitcoin wallets are eminently hackable. Cases have been reported of investors losing more than $1m (£614,000). 3. ‘You are not protected when using virtual currencies as a means of payment’ – part of the attraction to Bitcoin and its cryptocurrency brethren is the fact that it isn’t overseen (ergo not guaranteed) by a government. That means if things go wrong, they really go wrong. 5. ‘Transactions in virtual currency may be misused for criminal activities’ – the EBA cautions that ‘law enforcement agencies may decide to close exchange platforms and prevent you from accessing or using any funds that the platforms may be holding for you’. Although that isn’t a common occurrence. 6. ‘You may be subject to tax liabilities’ – probably the scariest warning of the lot. You could argue that the EBA would say that: you wouldn't expect it to be pro a non-European, difficult-to-tax method of payment. And the majority of serious Bitcoin investors are well aware of the risks. The currency’s drop this week suggests that Bitcoin fever might be over for now (although, to be fair, we said that ages ago). That hasn’t stopped investor Andreessen Horowitz (which also backs Airbnb, Facebook and Skype) from taking a punt on the currency. It’s put $25m into Coinbase, a digital currency trading platform with 600,000-odd users. In a blog on its website, Andreessen Horowitz says it was attracted not by ‘the speculative aspect of the digital currency, but by Bitcoin’s advantages as a payment network’. Presumably, though, until Bitcoin stabilises, setting prices with it will be difficult. We’ll know it’s actually hit the mainstream once you can buy a can of coke and a packet of crisps with it. Until then, MT will stick to speculation.